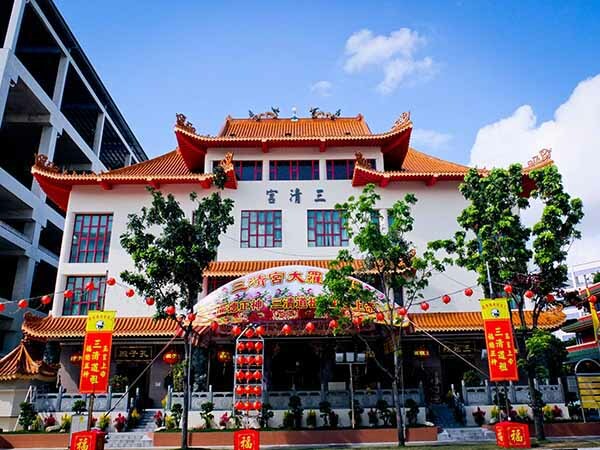 “San Qing Gong” – An Introduction “San Qing Gong”, a renowned big establishment Taoist temple located in the Eastern part of Singapore, was founded in March 2003. Presently, it houses the Taoist Federation Singapore, the Taoist Federation Youth Group, Taoist College of Singapore, with the primary objective of promoting Taoism in Singapore. A spectacular building, embraced by elaborated traditionally crafted sculpture of vivid soaring dragons coiled around stone crafted pillars, the main hall of “San Qing Gong” houses the Southeast Asia’s most magnificent and extraordinary thirteen metres wide, twenty metres high, nine metres in depth Taoist shrine, which earned an recognition in the Singapore Book of Records as the “Singapore’s tallest shrine”. The main shrine consecrates the key honorable “Da Luo Tian” Taoist Deities and respectable Confucius and Confucian Sages. The rear of the four storied building housed esteem surnames Ancestral bone ashes and memorial tablets. The “Da Luo” Prayer Hall In order to prominently illustrate the different hierarchy of Taoist respectable deities and to instill the right conceptual towards each of the deities, the “San Qing Gong” management committee proposed to make a major renovation of the main (Da Luo) prayer hall around 2011. Taoist devotees believe that the “Da Luo Tian” is the highest heavenly place where our Three Taoist Supreme “San Qing Dao Zu” (Yuan Shi Tian Zun, Ling Bao Tian Zun, and Dao De Tian Zun) reside. The entire Shrine was remodeled and re-built with fine craftsmanship structures to perfectly present the highest superior image of the each different official level of the three Taoist Supreme, heavenly deities, and earthly deities worshiped by Taoist devotees. 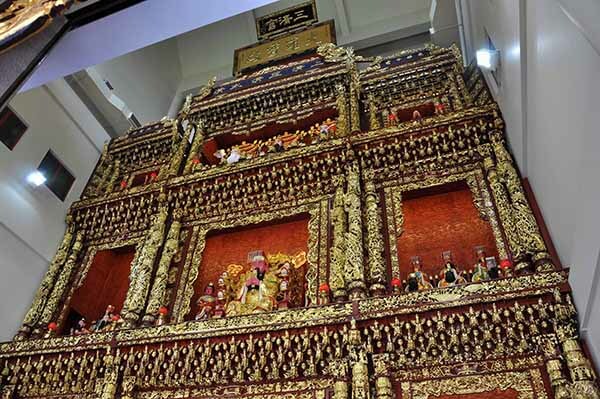 The “Da Luo” Prayer Hall was officially re-opened in January 2012 with a new fresh look superb Taoist shrine of thirteen metres wide, twenty metres high, nine metres in depth. The highest level of the Taoist shrine is being consecrate to the highest Taoist deities which includes the Three Purely Supremes “San Qing Dao Zu”, the deity which in charge of all male immortal “Dong Hua Di Jun”, the deity which in charge of all female immortal “Yao Chi Jin Mu” also known as “Xi Wang Mu”. The middle level consecrated to respectable deities which include renowned Taoist deity – Jade Emperor “Yu Huang Da Di”, the Celestial Masters “Zheng Yi Tian Shi” and “Xuan Tian Shang Ti”, the three heavenly official in charge of heaven, earth and water “San Guan Da Di”, and deity “Si Yu”, the various deity in charge of all earthly matters which include “Zi Wei Bei Ji Da Di”, “Gou Chen Shang Gong Tian Huang Da Di” and “Hou Tu Huang Di Qi”. The lower level consecrated the earthly deities which include the “Fu De Zheng Sheng” also commonly known as “Dai Bo Gong”, and God of Wealth “Wen Cai Shen” and “Wu Cai Shen”. Renovation works were also being carried out on the shrines residing in the Confucius and Founding Masters “San Zu” prayer hall. The shrine in the Confucius prayer hall consecrated the Confucius and his 72 disciples. Each year in celebration of Confucius birthday, ritual ceremony was being held where devotees who are still schooling came forward to seek blessing from Confucius to have good results and bright future prospects. Whilst at the Founding Masters “San Zu” prayer hall, it consecrated famous “Quan Zhen” Taoist Masters who have attained enlightenment which include “Lu Chun Yang”, “Wang Zhong Yang”, “Qiu Chang Chun”, and famous medical sages that have contributed significantly in the society like medical sage “Zhang Zhong Jing”, medicine sage “Wang Si Miao”, magnificent doctor “Hua Tuo” and Goddess of Mercy which is better known as “Ci Hang Zhen Ren” in Taoist. “San Qing Gong” unifies the Taoism, Confucianism, and Taoist deities Worship under one roof, and it has significantly shown the spirit of embracing all other teachings and also express one respect to Taoist teachers and masters. Beyond the Main Prayer Hall “San Qing Gong” accordance to one well known Geomancy Master, is situated on a symbolic land shaped like a “groundnut” with the main entrance facing the North East direction, and with a river flowing behind the building. Guiding the main entrance of the main temple building are the two “Deva Kings”. At the ceiling of the entrance, the auspicious palace bell which rang every morning to bless devotees to realise their good dreams, while the auspicious drum which roll in the evening stablise the Taoist “Yin” and “Yang” elements of all earth beings. Located on the left side of the main temple building, is a long stone wall crafted with the “Dao De Jin” scripture containing 5000 words. This scripture wall which was officiated by our former President of State Mr Nathan, has also earned its recognition to be South East Asia first longest and perfectly engraved Lao Zi’s “Dao De Jin” scripture monument with the five thousand words under the hands of renowned China calligrapher Mr Chen Han Bin. 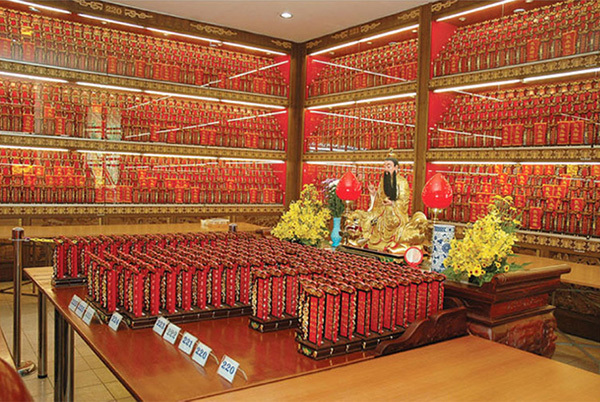 Besides, being a superb “Feng Shui” blessed perfect harmonized place of worship, “San Qing Gong” is also the official place to issue the Jade Emperor Taoist Decree to other local temples which require it to carry out ritual prayer and ceremony. Our residential Taoist priests also conduct daily morning and evening Taoist ritual chanting to give blessing to beings and remission to the deceased. The temple has also installed latest technology multi-column revolving “Tai Shang Lao Jun” blessing light beacon, the five directions god of wealth fortune blessing lights, and the Confucius lights of fame for devotees to register so as to seek blessings from the various deities. Taoist recognizes the importance of remembrance of our ancestors and also to provide a perfect final resting place when one deceased. 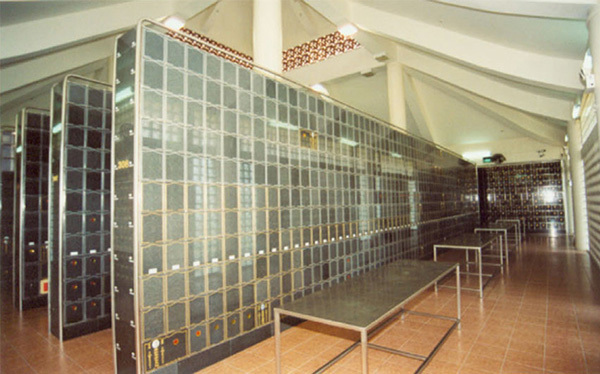 The “Huai Si Tang” which is located on the second and third floor of the building, is being set up to accommodate ancestral tablets and bone ashes urns of deceased of any surnames regardless of race and even religion. SanQingGong 2013 All Rights Reserved.